Hello again, 2 days in a row! I have a card to share with you for Midweek Magnolias Challenge #113 Use a Number!! I only replaced a few of my crafting supplies like Distressed Inks, a few die cuts, and special papers, boy was it hard to create without the million items I had. lol I do like the challenge of designing a card with a few things as it brings more of my creativity out and I am so grateful to at least have a moment to make something. I used Pion papers with Tilda With Heartphone from the World Wide Web Collection as well as the icons, aren't they adorable. I apologize for not having more photos on here but I have to practice more as I have a new camera and no photo booth, I am primitive here, lol She was a joy to make. I hope you make a creation using a Number for the new challenge at Midweek Magnolias so you can win a prize. I love seeing my friends there too. Beautiful card Kelly, I love the soft colours and this stamp is so cute. Sweet card, and so nice design ! Oh my this is gorgeous Kelly!! Love the design and your Tilda is fabulous!! Have a great day! You haven't lost your touch! What a beauty! Love the soft colors and your design is awesome! Love it all! Awww it's so fab to see you creating again Kelly… and what a beautiful card this is…. 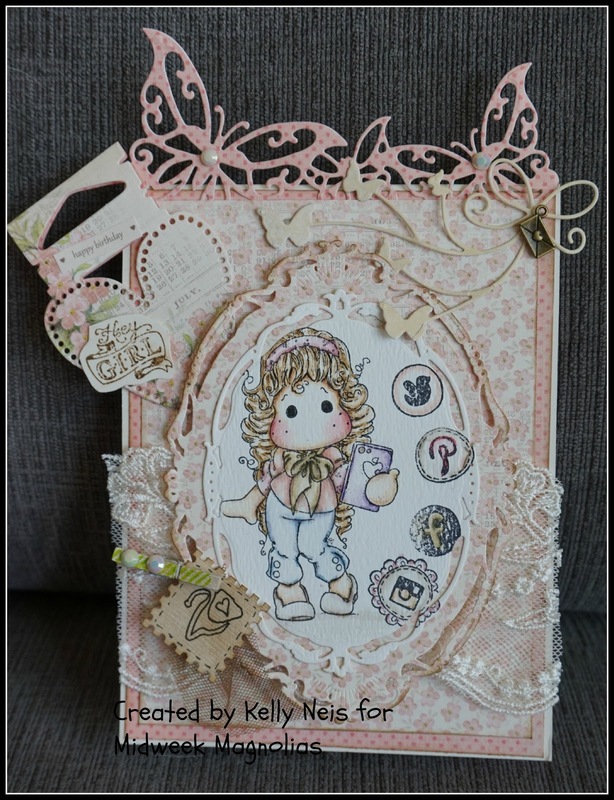 such an adorable image and your soft colouring is just perfect… love the gorgeous papers and embellies… the card is delicate and SO pretty!! Hope you have a good evening hun! Gorgeous card Kelly! I love the softness of the colours and your colouring is beautiful. Another beauty, Kelly! I just love her heart phone! So adorable!!! This is so cute Kelly! Glad to see you back creating and this little stunner is fabulous. So girly and romantic.